I was up and showered and out walking Mix by twenty to eight this morning because I had to meet with my life-style adviser at 8.30. I was there in good time and went in clutching my diary of all I had eaten and drunk over the last month and with my pedometer readings to account for the exercise I had been taking. Almost immediately I found myself on the scales and I was surprised and pleased to discover that I have lost half a stone in the four weeks of this programme. My adviser was delighted and I must confess to being slightly surprised. However it seems that this is just the start. I only require to lose another stone and a half and then I will move into the category of just being ‘over-weight’! I have been promised more energy, a greater quality of life and even that I will enjoy my food more. I came home with another appointment for next month only to hear on the radio a new study has discovered that people who are overweight are much less like to get dementia while people who are underweight are much more likely to suffer from this disease. Decided that this morning I would have to get my blog up to date and, indeed, by lunchtime I had achieved that. I am at a bit of a cross roads with my blog and part of me thinks that now is the time to stop it altogether. I seem to be so busy and my current lifestyle (which I enjoy) just doesn’t permit the time I need to do it justice. Still I enjoy having my blog because it gives me something to look back on and see not just what I did but also what I was thinking about things. Of course, I could do all of that by keeping a diary but I know that I wouldn’t have the discipline for that. It is only the fact that I have to put it on line which gets it done and also which compels me to take pictures for the blog which are the real fun of looking back as the years go by. Well, we shall see. I celebrated losing weight by having three cheese rolls for lunch and I looked up Sang’s facebook page and watched the videos he has made of the new puppies and their extravagant names – Leviathan, Rommel, Monty and our Bramble who will soon be making the journey south to Mount Pleasant. Rachel went out to walk Rowan this morning and was away for three hours, so I was getting a bit concerned but she returned and, as so much of the day had passed, we decided that rather than continue on the boat we would try to make sense of the carriage shed, moving boxes out into the sunshine of the courtyard before packing them away again with room for more to follow from the Hen House. By the end of the afternoon we had unloaded more than twenty-five boxes of books – the majority of them are now spread over the Bothy and my task over the next little while is to get them all unopened and sorted onto the shelves. 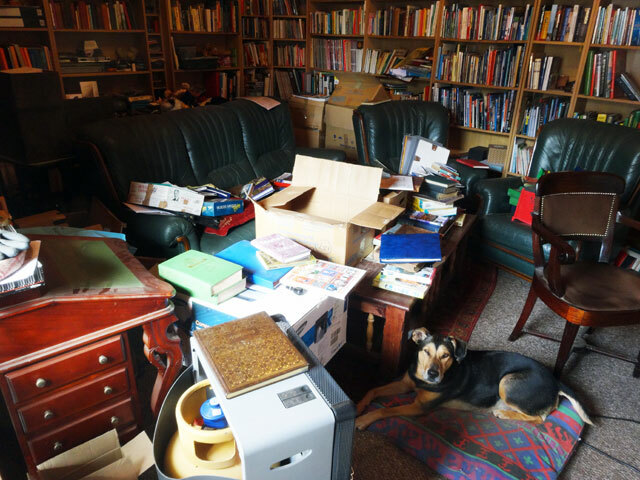 I could have done without it but Rachel was desperate to get her books into her new study and we found lots of her books as well – and as we open all of the boxes who knows what else we shall find! We all dined together in the farmhouse (after I had walked Mix) and then I ran Mum into Duns where she was going to see her hairdresser in the local show. Back home, Rachel and I watched a Montalbano on the television – however, both of us fell asleep and we walked the dogs and were in bed before ten!